The paper deals with the distribution and enrichment of natural radionuclides 232Th, 226Ra, and 40K in the soil samples of Mangalore. The soil samples collected from the region were analyzed for the activity of natural radionuclides using NaI (Tl) gamma-ray spectrometer. The activity of 232Th varies in the range 40.5–95.2 Bq/kg with a mean value of 64.9 Bq/kg; the activity of 226Ra varies in the range 54.9–77.8 Bq/kg with a mean value of 65.1 Bq/kg; and that of 40K varies in the range 308.7–486.5 Bq/kg with a mean value of 368.9 Bq/kg. The calculated values of radiological parameters were found to be below the world recommended level. The results of these systematic studies are presented and discussed in this paper. Mangalore, an important region of the southwest coast of India, is heading to become a major industrial activity center with oil refineries, petrochemical complexes, chemical and fertilizer factories, thermal power stations, and a host of other industries. In view of this, detailed studies on radiation level and radionuclide distribution have been carried out in the environment of the region. As part of the program, the absorbed gamma dose rate in air in the environment of the region was measured using portable scintillometer. The soil samples collected from the region were analyzed for the activities of 232Th,226 Ra, and 40K to understand the distribution and enrichment of these radionuclides. The radionuclide content of various components of the ecosystem depends on the interactions of a large number of different factors. These include the nature of the radionuclide itself, the site-specific characteristics, physicochemical properties of the soil, variation in plant cover, and climatic conditions. In view of this, the dependence of the activity with some of the soil physicochemical parameters has also been studied. Radiological parameters, namely, radium equivalent activity (Raeq), external exposure index (Eex) and internal exposure index (Ein), were calculated from the activities of 232Th,226 Ra, and 40K to evaluate the risk due to these radionuclides to the human beings in the region. The results of these investigations are presented and discussed in this paper. In the present study, 16 soil samples were collected from Mangalore and surrounding areas in a radius of about 10 km. The map showing the sampling locations is shown in [Figure 1]. The samples were collected and processed following standard procedures. The soil samples collected were brought to the laboratory, dried, ground, sieved, and filled in airtight plastic containers and stored for 1 month to ensure secular equilibrium between 226 Ra and its short-lived progeny. The containers were sealed carefully to avoid the escape of gaseous 222 Rn and 220 Rn. These samples were subjected to gamma spectrometry. Gamma-ray spectra from the samples are recorded using a high efficiency 5” × 5” NaI (Tl) detector coupled to a 4K multichannel analyzer. The gamma-ray spectrometer was calibrated using standard sources, and the efficiency of the detector was determined experimentally. The activity concentration of 232Th was evaluated from 2614 keV gamma line of 208 Tl, the activity concentration of 226 Ra from 1764 keV gamma line of 214 Bi and that of 40K from its 1461 keV photopeak. 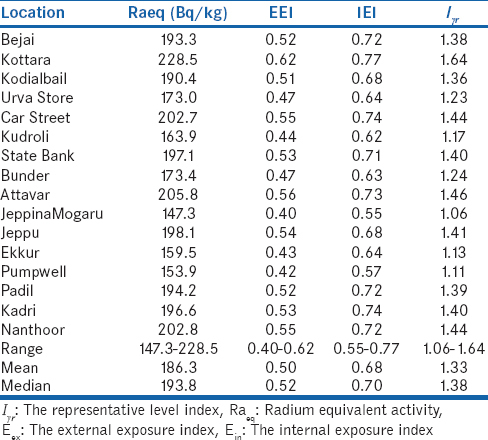 The hazard index parameters such as radium equivalent activity, external exposure index, internal exposure index, and representative level index were evaluated from the measured activities of natural radionuclides following standard methods. Several methods are available for the analysis of the spectra from Nal (TI) detector. Spectrum stripping, the simultaneous equation method, and method of least squares are the prominently used methods. If the spectrum has two gamma energies that of 40K and 137 Cs, which are well separated, the simple stripping method can be employed. In case where samples contain 4 or 5 or more radionuclides, and the gamma energies are closely spaced, simultaneous equations method was employed for the analysis. In the present work, the simultaneous equations method was employed for the analysis of the spectrum and to determine the activity of various radionuclides.,, In this method, the Compton-corrected and background-subtracted count rates for the three radionuclides of interest are given by the following equations. Here, C1, C2, and C3 are the Compton-corrected and background-subtracted counts under the photopeaks of 232Th,226 Ra, and 40K and T2.61,T1.76, and T1.46 are the total integral count under the photopeaks of 208 Tl,214 Bi, and 40K, respectively, and F1,F2, and F3 are Compton contribution factors of 232Th on 226 Ra,232Th on 40K, and 226 Ra on 40K, respectively. From the Compton-corrected count, the activity (A, Bq/kg) of 40K,226 Ra, and 232Th were estimated from the following equation. Where, C is the Compton-corrected count rate under the photopeak, SD is the standard deviation, E is the photopeak efficiency (%) of the detector, A is the abundance of characteristic gamma-ray and W is the weight of the sample in grams. To obtain uniformity in the exposure, total activity was calculated regarding radium equivalent activity (Raeq) from the following equation. Where, ARa, ATh, and AK are the specific activities of 226 Ra,232Th, and 40K expressed in Bq/kg. Radium equivalent concept allows a single index or number and is widely used hazard index to describe the gamma output from different mixers of uranium, thorium, and potassium in the samples. The external exposure index (Eex), due to the emitted gamma rays, from the samples were calculated from the following equation. Where, ARa, ATh, and AK are activity concentration of 226 Ra,232Th, and 40K, in Bq/kg. Where CRa,CTh, and Ck are the specific activities of 226 Ra,232Th and 40K Bq/kg. The results of the activity of naturally occurring radionuclides in soil samples of Mangalore are given in [Table 1]. The activity of 232Th varies in the range 40.5–95.2 Bq/kg with a mean value of 64.9 Bq/kg; the activity of 226 Ra varies in the range 54.9–77.8 Bq/kg with a mean value of 65.1 Bq/kg and that of 40K varies in the range 308.7–486.5 Bq/kg with a mean value of 368.9 Bq/kg. 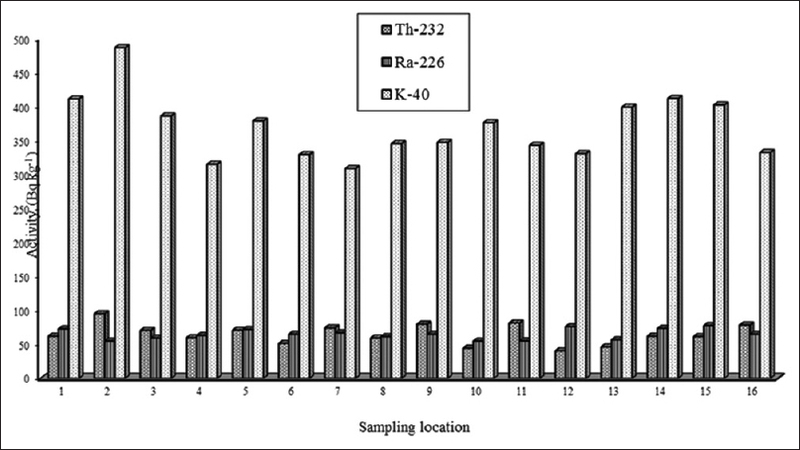 The variation of activities of 232Th,226 Ra, and 40K in different sampling stations is shown in [Figure 2]. The activities of 232Th and 40K vary widely within the study area; however, the activities of 226 Ra were almost constant which indicate that the migration of this radionuclide in the environment is less. 226Ra does not migrate in soil unless it is deposited on the ground. A comparison of mean activity of 232Th, 226Ra, and 40K indicates that 40K is the dominant gamma-emitting source in the soil. This can be attributed to the geological structure of the region. The soils weathered from the rocks, which are rich in heavy metals and radioactive minerals can contribute to the enhanced level of 40K activity. [Table 1] also gives the activity ratio of 232Th and 226 Ra;232Th and 40K. These ratios indicate that 232Th enrichment is more compared to 226 Ra and less compared to 40K. The calculated mean 232Th and 226 Ra activities were approximately double the world mean values of 30 Bq/kg and 35 Bq/kg, respectively. The higher 232Th and 226 Ra activities observed in the soil samples may be traced to the laterite type of soil prevailing in the region. The mean activity of 232Th (64.9 Bq/kg) in soil is comparable with all India average value of 64 Bq/kg. The mean 40K activity (368.9 Bq/kg) was less comparable with the world mean of 400 Bq/kg. However, the measured activities of 40K were high compared to other normal background regions in the world. It indicates that in the sampling areas of the environment of the region leaching of 40K due to rain was less. The correlation between 226 Ra and 232Th;226 Ra and 40K;232Th and 40K was studied from the activity of these radionuclides. In all the three cases, poor correlation was observed and it indicates that individual results for any one of the radionuclides activity in each pair are not, therefore, a good predictor of individual values for the other. 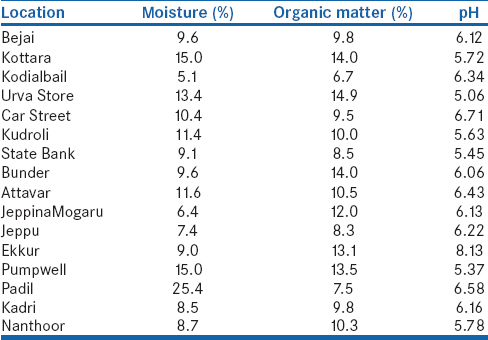 Some of the soil physicochemical parameters are measured and is summarized in [Table 2]. The correlation between the activities of 232Th,226 Ra, and 40K with soil physicochemical parameters, namely moisture content, organic matter content, and pH was insignificant. To evaluate the risk to the human beings in the environment of the region, the radium equivalent activity Raeq (the single quantity which represents the specific activities of 232Th,226 Ra, and 40K) was estimated from the activities of naturally occurring radionuclides [Table 3]. The radium equivalent activity calculated varies in the range 147.3–228.5 Bq/kg with a mean value of 186.3 Bq/kg. It can be seen that the mean radium equivalent activity in the soil samples of Mangalore environment lies much below the International recommended the limit of 370 Bq/kg. Among soil sampling stations, maximum Raeq value of 228.5 Bq/kg was found at Kottara and minimum of 147.3 Bq/kg at Jeppinamogaru. External exposure index (Eex) was calculated from the activities of 232Th,226 Ra, and 40K and is summarized in [Table 3]. The value of this index must be less than the unity for the radiation hazard to be negligible. The Eex for Mangalore soils ranges from 0.40–0.62 with a mean value of 0.50. The maximum Eex (0.62) was observed at Kottara, and in all the sampling locations, the Eex values were less than the unity. The calculated values of Ein for soil samples of Mangalore range from 0.55 to 0.77 with a mean value of 0.68 [Table 3]. The value of this index must be less than the unity for the radiation hazard to be negligible. In the present work, maximum value of Ein (0.77) was observed at Kottara, and in all the sampling stations, the Ein values were less than the unity. The representative level index (Iγr) for soil samples of Mangalore ranges from 1.06 to 1.64 with a mean value of 1.33 [Table 3]. The value of this index must be less than the unity for the radiation hazard to be negligible. The maximum value of Iγr (1.64) was observed at Kottara, and in all the sampling stations, the Ein values were higher than the unity. The activity of 226 Ra in different sampling stations is close to the mean value. However, the activities of 232Th and 40K vary significantly from place to place. The radionuclide 40K is the dominant gamma emitting source in the soil. The radioactivity in soil is controlled mainly by the mineralogy of the parent material and the extent of further weathering and leaching. The poor correlation observed between the activities of radionuclides indicates that individual results for any one of the radionuclides activity in each pair is not, therefore, a good predictor of individual values for the other. The values obtained for radiological parameters were below the recommended level except representative level index. The authors are grateful to Prof. K. M. Kaveriappa, Vice-Chancellor, Mangalore University and Prof. K. Siddappa, former Vice-Chancellor, Bangalore University for their encouragement. The authors are also grateful to Dr. K. M. Balakrishna, Professor and Chairman, Department of Physics, Mangalore University for his support. Herbert LV, de Planque G. EML Procedure Manual. 26th ed. New York: Environmental Measurement Laboratory; 1983. Narayana Y, Somashekarappa HM, Karunakara N, Avadhani DN, Mahesh HM, Siddappa K, et al. Natural radioactivity in the soil samples of coastal Karnataka of South India. Health Phys 2001;80:24-33. Abani MC. Methods for Processing of Complex Gamma Ray Spectra Using Computers. Refresher Course in Gamma Ray Spectrometry. Technical Report no. BARC/1995/E/008. Mumbai: Bhabha Atomic Research Centre; 1995. Mehra R, Singh S, Singh K, Sonkawade R. 226Ra, 232Th and 40K analysis in soil samples from some areas of Malwa region, Punjab, India using gamma ray spectrometry. Environ Monit Assess 2007;134:333-42. Shetty PK, Narayana Y, Siddappa K. Vertical profiles and enrichment pattern of natural radionuclides in monazite areas of coastal Kerala. J Environ Radioact 2006;86:132-42. Ramola C, Rautela BS, Gusain GS, Yadhav M, Sahoo SK, Tokonami S. Natural radionuclide analysis in Chhattarpur area of South Eastern area of Odisha, India. Acta Geophys 2013;61:1038-45. 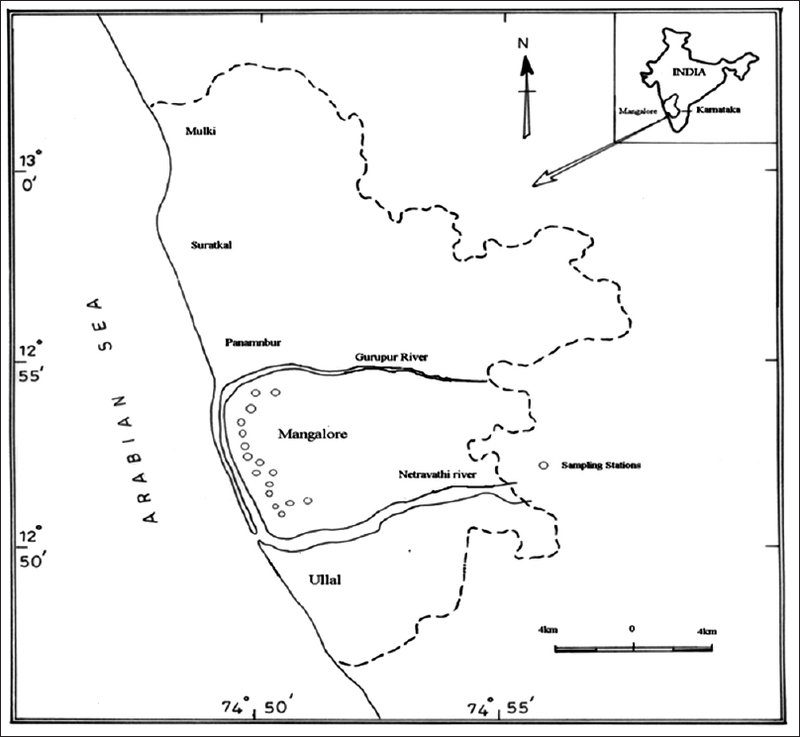 Ramasamy V, Sundarrajan M, Paramasivam K, Meenakshisundaram V, Suresh G. Assessment of spatial distribution and radiological hazardous nature of radionuclides in high background radiation area, Kerala, India. Appl Radiat Isot 2013;73:21-31. Al-Saleh FS, Al-Berzan B. Measurement of natural radioactivity in some kinds of marble and granite used in Riyadh region. J Nucl Radiat Phys 2007;2:25-36. Nuclear Energy Agency. Exposure from Natural Radioactivity in Building Materials, Reported by NEA Group of Experts. Paris: Organization for Economic Co-operation and Development, Nuclear Energy Agency; 1979. Frissel MJ, Koster HW. Radium in soil. In: The Environmental Behavior of Radium. Vol. 1. Vienna: IAEA; 1990. United Nations Scientific Committee on the Effects of Atomic Radiation, Sources and Effects of Ionizing Radiation. Report to the General Assembly with Scientific Annex, Annex, United Nations, New York; 2000.